Origin: This was another of the many towns granted along the Connecticut River in 1761. Lyme takes its name from Old Lyme, which lies at the mouth of the Connecticut River. For many years, the town's name was spelled as Lime in official state documents, however this eventually was decreed a misspelling. Most of the original grantees were from Palmer and Brimfield in Massachusetts, or from Londonderry, New Hampshire. Lyme was one of the 16 towns involved in a protracted border dispute with the independent state of Vermont, before it was admitted to the Union in 1791. Population Trends: Population change for Lyme totaled 671 over 52 years, from 1,026 in 1960 to 1,697 in 2012. The largest decennial percent change was a 19 percent increase between 1980 and 1990; the smallest change was two percent between 2000 and 2010. 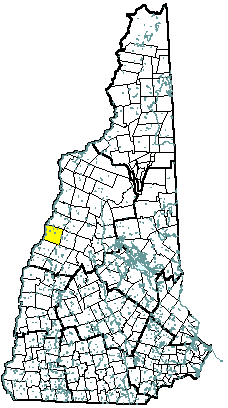 The 2012 Census estimate for Lyme was 1,697 residents, which ranked 149th among New Hampshire's incorporated cities and towns. Population Density and Land Area, 2010 (US Census Bureau): 31.9 persons per square mile of land area. Lyme contains 53.8 square miles of land area and 0.9 square miles of inland water area.